is a programming languages built and maintained by JetBrain. As the most common combination, Spring Boot and Kotlin provide developers with a perfect fit for a microservices application infrastructures, and Instana’s JVM Monitoring offers comprehensive performance and health management for applications and services written in Kotlin. Comprehensive Kotlin/JVM Monitoring requires performance visibility for the physical or virtual host, containers, JVM instances, typical JVM metrics (like Garbage Collection data), and any application and service code deployed into the JVM instance. Instana is the quickest and easiest way to monitor Kotlin based services across the stack to deliver comprehensive application insights. The Instana agent automatically discovers all JVM instances, deploys the necessary monitoring sensors and begins tracing applications and requests. Instana also automatically determines not only the health of the JVM instances, but also for applications and services running inside. Once deployed, the Instana Agent automatically identifies all running Kotlin application instances – then deploys and configures Instana’s Kotlin Monitoring sensor without any manual effort, as well as additional sensors for technologies used in the Java applications running inside the JVM. 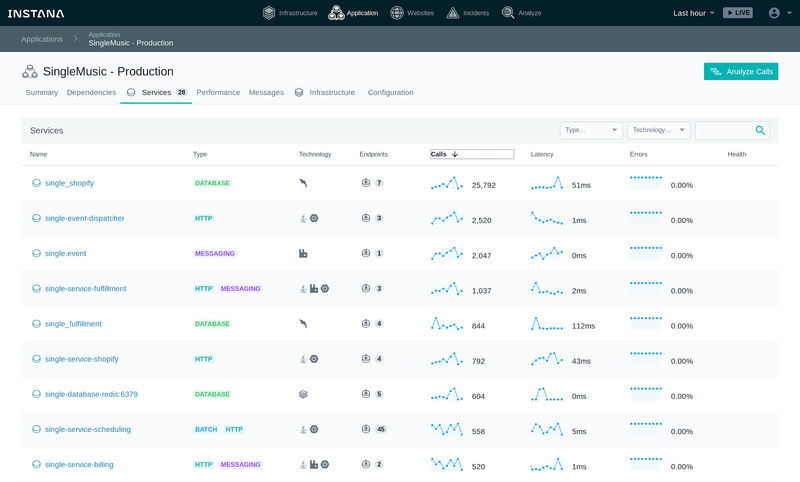 Instana’s curated knowledge base already knows what performance metrics are relevant for collection and how to collect them. To monitor Java services health, additional metrics are also collected. Since Instana’s automatic configuration collects all relevant information, monitoring Java instances couldn’t be easier. To determine overall service health, the Instana Kotlin Monitoring sensor also collects KPIs on the monitored JVM-running environment to determine its health status. With the help of Artificial Intelligence (AI) and health signatures from the curated knowledge base, Instana automatically detects issues with individual JVm instances and and issues service incidents. Based on severity, Instana automates incident escalation and root cause identification, helping you solve issues before users are impacted. Additional metrics are acquired based on technologies and frameworks deployed into the Kotlin applicatation or service.